The history of container ships began in 1956 with Ideal X, a converted T2 oil tanker whose deck had been strengthened to accommodate containers. The ship carried 58 35-feet (8 feet wide by 8 feet high) containers, along with a regular load of 15,000 tons of bulk petroleum from Newark, New Jersey to Houston, Texas in April 26, 1956. With the inaugural voyage of the Ideal X, the container era in world trade truly began. Ideal X with the world's first load of containers. Containerships can be divided into development generations based on capacity, which is determined by number of TEU to carry on board. Please note that 1 TEU is equivalent to space dominated by an ISO container with length, width, and height of 20’, 8’, and 8’6” respectively. Storage containers are transported all across the globe by large container vessels, built with enough room and weight to carry the large and heavy shipments. A container for storage can carry just about any cargo, and these massive ships were the facilitators. Generally, there are 6 generations, each of which have a marking time and according range of capacity. Dividing into generations like above-said is only relative, and usually used to assess the technology development in the industry. Modern liners belonging to sixth generation (over 8,000TEUs) are in operating together with smaller vessels with capacity ranging from a few hundred to thousands of TEUs. That means, at the same time, many generations can be in service. In fact, vessels with different sizes are deployed on different routes: those with capacity of around 1,000 TEUs are suitable for feeder services, while larger ships of thousand TEUs as mother vessels can serve on trans-ocean routes. Nowadays, about 90% non-bulk cargo in the world is transported in containers, and container vessels of the latest generation can carry up to 15,000TEUs. In Feb 2011, Maersk Lines placed an order for 10 ships of 18,000 TEU each. As of May 2011, the world saw a fleet of 5,020 purpose-built box vessels, with an aggregate capacity of 14.77 million TEU. Detail about the vessel number of each capacity range are shown in the following table. 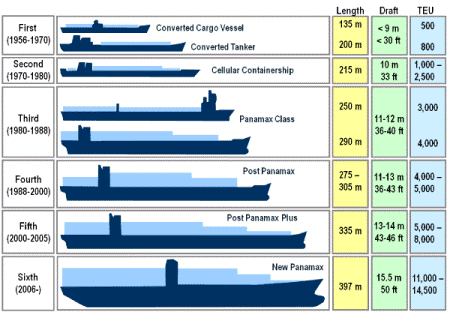 Since Ideal X, the first container ship set sail in 1956, the sizes and capacity of container vessel category has developed dramatically for the economy of scale. Up to January 2010, MSC Daniela with public nominal capacity of 13,800 TEUs is considered one of the biggest container ships in the world. To many people, MSC Daniela is even bigger than the E-class containerships of Maersk Lines (nominal capacity of 11,000TEUs). The method used to estimate nominal capacity of those giants is controversy. Many people say that E-Class model in fact are much larger than what Maersk Lines publicly reported, and up to 13,600 TEUs (according to Containerisation International), or even 15,212TEUs (AXS Alphaliner). The discrepancy lies in the way calculating capacity without affecting human vision from the vessel bridge. MSC Daniela has superstructure closer to fore, thus less affect the vision, and accordingly increase nominal capacity. For easy comparison, main particulars of MSC Daniela and Emma Maersk are introduced in following tables. In term of deadweight, MSC Daniela (156.301 DWT) appears bigger than Emma Maersk (152.800 DWT). When sizes are considered, however, Emma Maersk is pretty larger. Anyway, perhaps we can stop such controversy when Maersk Line orders 10 ‘Triple-E’ mega-ships, each of which will have a capacity of 18,000 TEU and will be delivered from Korea’s DSME shipyard from 2013 to 2015.